HAVANA. Cuba -- The Rolling Stones are gearing up for an historic free concert on Friday in Cuba, where the communist leadership once silenced rock and roll music. 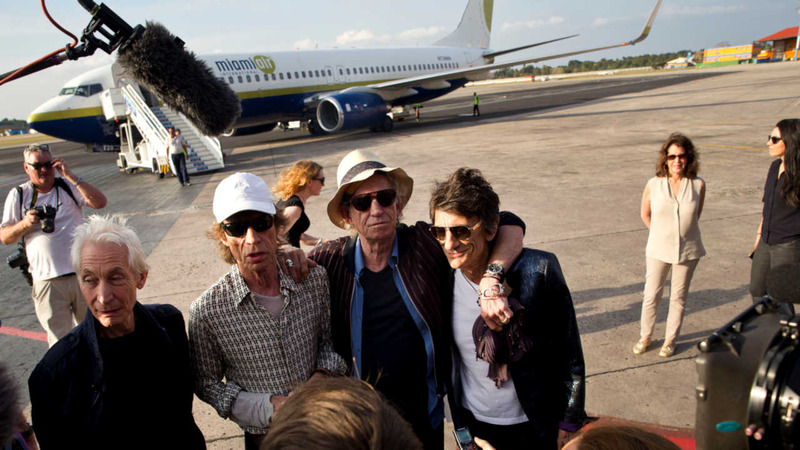 The band arrived Thursday evening in the Cuban capital where the concert will be held. "Obviously something has happened in the last few years," lead singer Mick Jagger said in English. "So, time changes everything... we are very pleased to be here and I'm sure it's going to be a great show." The concert comes three days after President Barack Obama wrapped up a visit to the communist-run island during which he declared an end to the last remnant of the Cold War in the Americas. Cuban musicologist Joaquin Borres characterized the event as "very important," saying it would be the biggest rock concert of its kind ever on the island. He predicted that it would encourage "other groups of that stature to come and perform." The Rolling Stones also transported a great amount of gear to the island for the concert, including seven huge screens and 1,300 kilograms (2,866 pounds) of sound equipment. The concert will be held outdoors at Havana's Ciudad Deportivo, where nearby streets were blocked to traffic beginning on Thursday.